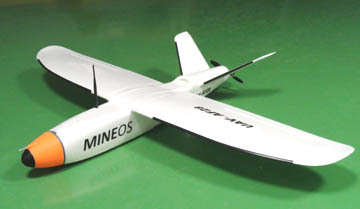 CATUAV adds to its fleet the new MINEOS UAV platform. This new model, initially developed for landmine detection in Bosnia, will also conduct commercial missions for other applications. It is notable for its low cost and its ability to operate fully automatically. As it weighs less than 2 kg it can legally fly beyond visual line of sight (BVLOS).